Discover what the standard tuition charge is for American schools, and how California State University - Northridge measures up. Learn how fees and tuition at California State University - Northridge match up to other U.S. colleges and universities and learn what you can do to properly get ready for potential college tuition increases. How do Tuition & Fees at California State University - Northridge Compare With Other Schools? For nationwide, regional and statewide comparisons, view the following table to see how California State University - Northridge measures up to other schools. California State University - Northridge fees and tuition is dramatically reduced for residents of California. For in-state students, tuition and fees is set at $6,875 for the 2017 - 2018 year, 63.3% off the price charged to out-of-state students. Tuition is $5,742 and fees $1,133. California State University - Northridge out-of-state students paid $18,755 in tuition and fees in 2017 - 2018. $1,133 was for fees, and $17,622 was tuition. View the following table to see 2017 - 2018 school year costs. How much does California State University - Northridge cost per credit hour? View California State University - Northridge cost per credit hour here. California State University - Northridge tuition and fees for out-of-state students grew at a standard yearly rate of 0.1% over the past 5 years. In the same time period, tuition grew by 0.0% and fees grew by 1.9%. Based on this, we estimate the cost of tuition and fees this year will total $18,776. For a two-year degree, we estimate tuition and fees will be $37,572 and $75,227 for a four-year degree. This does not cover additional charges including room and board, books, and transportation. 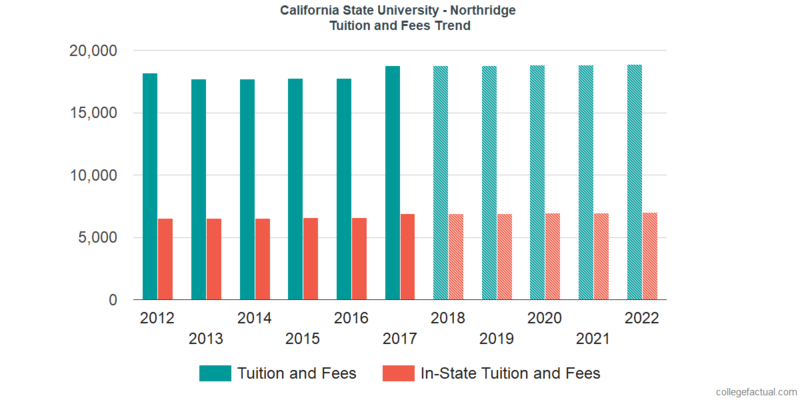 See the following chart to find out how California State University - Northridge tuition and fees may grow including residency based discounts in the future. At most schools you will end up spending more for your last year of college than you will in your first. This is due to annual price increases. It's smart to keep yourself updated!